No outfit is complete without the right accessories. At MIF, you can find beautiful costume jewelry at very reasonable prices. Meenal's Indian Fashions carries an extensive selection ladies fashion jewelry - necklace sets, bangles - both ladies and girls' sizes, designer earrings, anklets, arm-tattoos, stick-on armlets, bundis, tikas, lakh jewelry etc. Only a few sample items are shown below or online ordering. Visit us or call us for your needs. Following represents only a small sampling of the items in stock. Please contact us for the availability of other styles, colors and sizes. 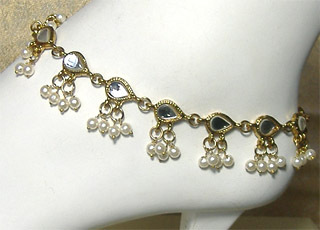 Beautiful anklet pair (also called Payal) with stone work and dangling white beads. 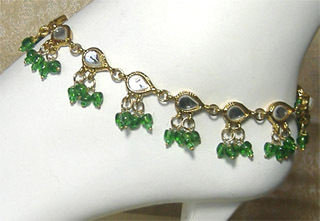 Beautiful anklet pair (also called Payal) with stone work and dangling green beads. 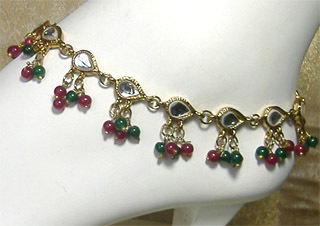 Beautiful anklet pair (also called Payal) with stone work and dangling green/red beads. 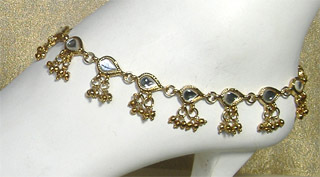 Beautiful anklet pair (also called Payal) with stone work and dangling brass beads. 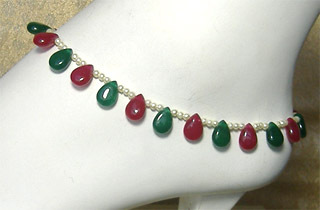 Beautiful anklet pair (also called Payal) on bead string and dangling green/red beads.